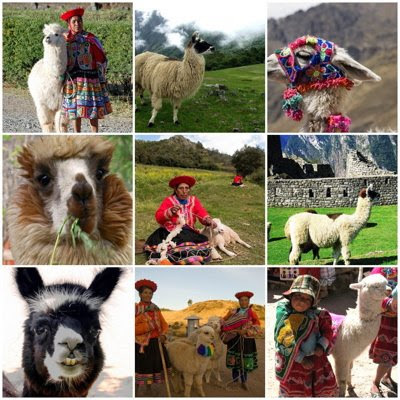 Peru is a land of two cultures, where colonial heritage and creole culture thrive by the sea, and where earflaps (as imitated at left), Quechua, camelids, Incan ruins, and textiles thrive in the highlands & mountains. Peruvian knitting owes much to both cultures, as the process was a European import, but it has long since taken on a remarkable, independent life of its own. Although the Spanish brought needles and knitting techniques to Peru, knitting found a ready audience in a culture already rich in textile design and production. Over the succeeding centuries, Quechuan culture appropriated knitting and added its own spectacular innovations. Because national borders don’t control cultural boundaries, I’m focusing this post on Andean knitting in general, so I will touch on Bolivian as well as Peruvian knitting. I’m convinced that some of the most astonishing, technically brilliant, inspired knitting today is being produced by Andean knitters. Although individual composition and innovation is highly valued, tradition holds strong and allows us to trace a few common elements. First and perhaps most distinctive: although Peruvian and Bolivian knitting is widely practiced by both sexes, Andean men are the primary knitters. 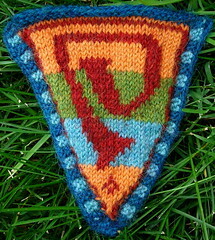 In many communities, knitting is much more likely to be done by men than by women. In areas such as Taquile (an island on Lake Titicaca), men knit almost obsessively from a very early age, and often on hats (ch’ullu, ch’ullo, chullo) that are subtly designed to reveal information about the maker or wearer. On Taquile Island, for instance, men wear hats with conical white tops to indicate they are single. Creating an elaborate, well-crafted hat is a signpost in a boy’s life, and young men take great pride in the degree of color and design complexity they can achieve in their “single man’s” chullo. Children learn to spin yarn at four or five, and are quite accomplished at producing fine yarns by the time they are knitting up extraordinary hats at the age of 7 or 8. Women, by the way, are traditionally in charge of dyeing. 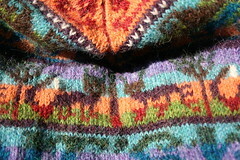 The chullo is the most ubiquitous knitted garment, but Andean knitters also make arm bands, leggings, ruffled caps (for young girls), and whimsical bags in the shape of people and animals. Other hallmarks of Peruvian knitting include a very, very fine gauge (somewhere between 9 and 15 stitches to the inch) and tightly-spun yarns, which make the fabric fairly self-confident (i.e., stiff). When resorted to, commercial yarns (including acrylic) are re-spun for a finer, tighter material. Needles are very fine—between 1.35 mm and 2 mm—and the almost mythical story is evidently true: some Andean knitters sharpen bicycle spokes for needles. Knitting in the round on four needles, color work is generally done via purling on the far side of the work with yarn tensioned around the neck (great explanation here, from Avital). 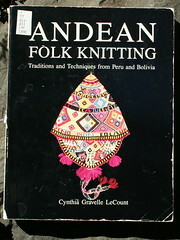 Much of the information about Andean knitting that I am conveying here comes from Cynthia Gravelle LeCount’s book, Andean Folk Knitting: Traditions and Techniques from Peru and Bolivia, 1990. Full of incredibly detailed accounts of individual knitting designs, techniques, and regional traditions, her thorough research is fascinating and meticulously illustrated. Although out of print, it is available at many libraries and through interlibrary loan. When copies of the book come up for sale on Internet auction sites, they go for $100 and up (check the link above for sale prices and the link in the bibliography section, below, for copies available in libraries near you). In addition to the rich content and illustrations (some photographic, some hand-drawn), LeCount includes a nice bibliography of sources on Andean textiles and anthropology. Alpacas: who can’t love them? 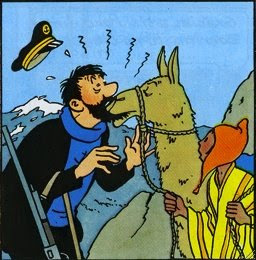 Camelids abound in the high altitudes of the Andes. They contribute their wool to the skilled Andean drop-spinners, as do sheep. 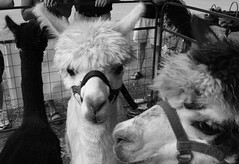 Although llamas are shorn, alpacas have softer fiber and are much more likely to be the source for yarn. Recently (as noted earlier), some acrylic yarns are making their way into Andean knitting, especially those that have been dyed in neon colors. 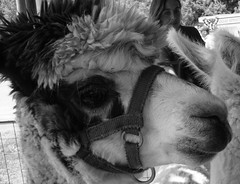 But alpaca fiber is the mainstay of Andean yarn and alpacas are constant companions for the alpine spinners and knitters. And who couldn’t adore the alpaca? They are somewhat timid (although not so shy as the ultimate fiber-producing camelid, the vicuña, a wild, endangered inhabitant of the Andean mountains that can only be shorn every three years for its exquisite fur), the alpaca has been domesticated for a very, very long time, and appears in artwork of the Moche people (CE 100 to 800). Its cuteness, I suppose, is because at 36 inches (91 cm. 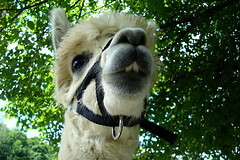 ), it looks like a small version of the llama (it is not, actually—unlike llamas, alpacas are not pack animals). Other endearing features include their constant humming, herding tendencies, poodle-like fur, enormous eyes, and mop-top hairdo (alpacas are way cuter than the Beatles ever were). More alpaca facts, courtesy of Cedar Brook Alpacas. Ah....design. My favorite part! I was completely delighted to learn that written messages regularly appear in Andean chullos and bags. Because they are knit at such a fine gauge, the letters can be (and are) robust (by which I mean that they are not spidery, one-stitch stick figures), several stitches-wide (often including serifs), and messages are long, often running from top to bottom across three or four pattern bands and including poetic sentiments. Initials, dates, general statements of ownership, even the marking of particular celebrations are often recorded in written letters on Andean hats. In particular, writing appears regularly on hats of the Ccatca (Qatqa’a) region of Peru. Chullos often feature tiered motif bands, stripes, and diagonal or diamond-shaped patterns (even OXOs!) that move up and off the head in a conical shape and usually in very bright colors. Animal and human motifs abound, especially snakes, foxes, felines, eagles and the viscacha (a large rodent, cousin to the chinchilla). Surface decoration is also important, so that shells, beads and buttons are often sewn onto the earflaps, which is the part of the chullo that is most visible (men usually wear felt hats on top of their chullos). Bright, multi-colored tassles appear on top and dangle from earflaps. With so many distinctive design traditions to choose from, I found it difficult to stick to just one, so I tried to make this chullo a composite of several. I started with the concepts of the earflapped chullo and lettering and expanded from there. In keeping with tradition, I included a message in one of the bands, and designed my own alphabet and message for the recipient. I am trying to write this up into a pattern, but that’s going to take time. I’d like to include a complete alphabet for those interested in writing out their own messages and at this point, it exists on graph paper, not in electronic form. Also, my knitting is unusual in that my vertical gauge is quite compact (more rows per inch than most knitters) and loose (smaller needles), so I’m going to have to figure out how to compensate for that. Very generally, here are the elements: I modeled the ribbing on the checkerboard style found throughout the Andes. There are three colors per row; I stranded the two not in use across the back. The ribbing tension is about 9 stitches to the inch, which makes the band a bit tighter than the rest of the hat (at about 8 stitches per inch). Animal designs are a fox with tail dipped in milk, a griffin, based on models graphed by LeCount from designs of the Potosí department and CalaCala (both in Bolivia), and snakes. 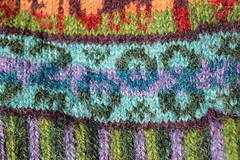 Earflap style is modeled on that of the southern Cuzco department (Peru; although I used a variant shaping technique to better foreground the monogram). Each flap features an initial of the hat’s intended wearer. I found the hat shaping somewhat difficult as I tried to work in motifs and shape. It should really be conical, not domed. Materials: I used the ultra soft, ultra cloud-like, Ultra Alpaca Light from Berroco, which is half super-fine alpaca, half Peruvian highland wool. Each skein is 1.75 oz/50 grams and 144 yds/133 m. Berroco recommends a gauge of 5.75 sts to the inch, although in keeping with Andean tradition, I knit it at a smaller gauge for a firmer fabric. Not quite able to manage the 10+ stitches per inch regularly achieved by Andean knitters, I went for 8 stitches to the inch. Berroco recommends 23 sts & 36 rows to 4 inches (10 cm) on 3.75 mm needles. I will have to stop here, because this topic could keep me going for many more moons, and I do need to move on to Q. I’m open to suggestions for Q, by the way! Lewandowski, Marcia. 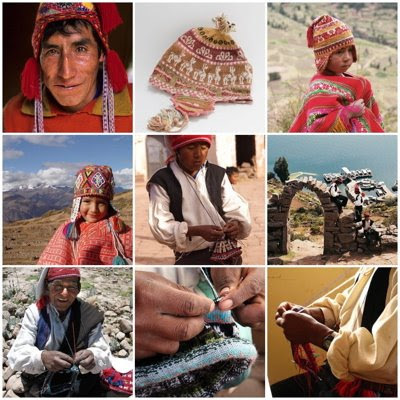 Andean Folk Knits: Great Designs from Peru, Chile, Argentina, Ecuador & Bolivia. Lark Books, 2006. This is a delightful book by a knitter who lived for many years in the Andes and brings a wonderful sensibility to her designs for Andean-style bags and hats. The photography is stunning. 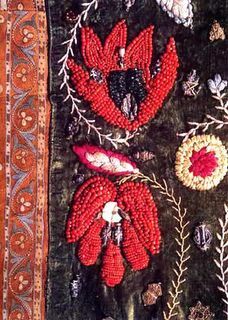 Heckman, Andrea M. Woven Stories: Andean Textiles and Rituals. University of New Mexico Press, 2003. Callañaupa, Nilda and Rowe, Ann P. “Men’s knitted caps from Chinchero (Cuzco)” Textile Museum Journal, vol. 38 and 39, p. 69-83. Willoughby, Janet. 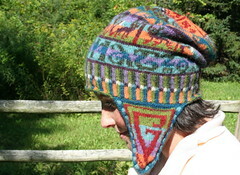 Peruvian Knitted Hats. Ends of the Earth, 2003. Description: This film shows men and women knitting hats in the villages of Accha Alta, Chinchero, Pitumarca and Chahuaytiri in the Cusco area and on the islands of Amantini and Taquile on Lake Titicaca. Textile Museum of Canada’s “Cloth & Clay: Communicating Culture” (online exhibition). Metropolitan Museum of Art (2004). Featured images available online. Abby’s Yarns. 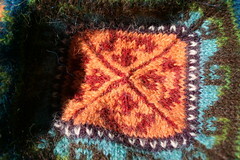 Blog post about Andean spinning. Very informative article by Catherine Vardy, originally published in Knitters’ Forum (Summer 1996), the newsletter of The Knitting Guild of Canada. Andean Earflap Hat by Mary Jane Mucklestone, originally published in Interweave Knits, Winter 2005. Now available free via pdf. The document includes seven different earflapped hats! Billie Jean Isbell is an anthropologist who has been active in the southern Andes since the late 60s. Also see Isbell’s Vicos: A Virtual Tour. “Knitting and Weaving in the Andes” by Cynthia LeCount Samake of Behind The Scenes Adventures (This the same Cynthia LeCount Gravelle who wrote the definitive book on Andean knitting) for the Cultured Traveler online newsletter. Cynthia LeCount Samake now leads textile tours to Peru with Nancy Thomas, former editor of Vogue Knitting and of Knitter’s Magazine. Samake is a textiles and costumes curator at the San Francisco Craft & Folk Art Museum and Bowers Museum in Santa Ana, California, and is apparently “working on a book for Random House, of contemporary knits with Andean motifs.” One upcoming tour is “Textiles & Treasures of Peru, Carnival & Crafts in Bolivia & Peru” with Nancy Thomas. P is for perfect, which is what I find your blog to be. Always informative and that chullo is fabulous. Looking forward to seeing the pattern, one of these days. I am impressed: what an interesting article you have written here! I love the pictures also very much. Beautiful chullo, lovely colors. What a delight! I had just read Marcia Lewandowski's book last week and up pops this wonderful post. I am working on a Bohus cardigan which means working on the wrong side in detailed colorwork with a mix of knits and purls, and discovered that using the Peruvian method of yarn around neck, thumb to move the yarn, was very helpful for the color that had the most purls. Great technique. Thanks for the hours of good reading you've provided with your project. What a great post! Personally I love the young men's hats that feature motorcycles! What a wonderful hat you knit for your lucky recipient. I never commented on your last great post, which has such wonderful samples with beautiful colors. so now you get two awards -- I didn't remember that Fluffbuff also gave you an award! Thanks everyone so much for all your encouragement and ideas for Q! I'm so glad to know that you're enjoying the posts. I'm deep into Q, now that I have your great suggestions, and am still trying to complete the charts (including TWO alphabets) for the chullo; the pattern itself is done. I hope to have some more content (i.e., the pattern and Q) in the next two weeks. Now I want to visit Peru even more! Thanks for the info, and check out my blog as I've tagged you in a blog award that's making the rounds. What an excellent post and the chullo is beautiful! I have to go check out that alpaca because I love the colors. I've been saving your post for a time that I could sit down and read it thourghly, I didn't want to skim. Your chullo hat is stupendous. It took me halfway through the post before I realized that you had made it and it wasn't one of the masterpieces that you were referring to. I love the idea of the fabric being "self-confident". You rock, I'm so glad we reconnected. I've mentioned you in my most recent post. Wow, thank you for the award! You are much too kind. I guess I wasn't reading the sidebar, huh? Wonderful article. I have a couple of chullos bought in Peru in the 60's and 70's. I'll have to dig them out and take a closer look at them. At the Arlington Va Farmer's Market, I recently saw a young woman carrying a small knitted bag she said had been given to her by her Bolivian mother -in-law. Her husband said it was probably a coca bag. When I looked at it closely I saw that it had a name and year 1952 (which the husband said was an important year historically). There were rows of figures - a row of mice, one of cats and one of dogs-- all on a bag no bigger than 6 inches. I forgot to say outstanding pictures! and thanks for nominating my blog! You are so sweet. i nominate you back! 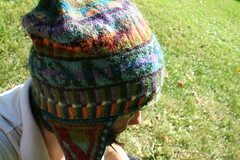 I have my daughter's friend who has asked for a hat and when I saw this one - loved the colours and so on.. However, I do feel that I could do one - the same for my daughter with a little more feminine colours... I am not that great as selecting colours: any recommendation on how to customize the colours ? Thank you so much for this informative posting- I made my daughters chullos many years ago - and now have friends working as missionaries in Peru. So interesting to read all about the Peruvian Knitters! I'm adding your blog on to my blog roll and will enjoy coming back again! Thank you for the great information. I will be back at this site a lot! I love the ethnic patterns and have spent a good part of my day searching for information....then SUCCESS! I found your site! Great job!